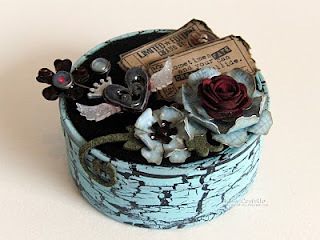 Simon Says Stamp and Show: Anything ... Lord Tim of Holtz inspired! OK ... a new week brings with it another new challenge! And the challenge this week is Simon Says Stamp and Show ... 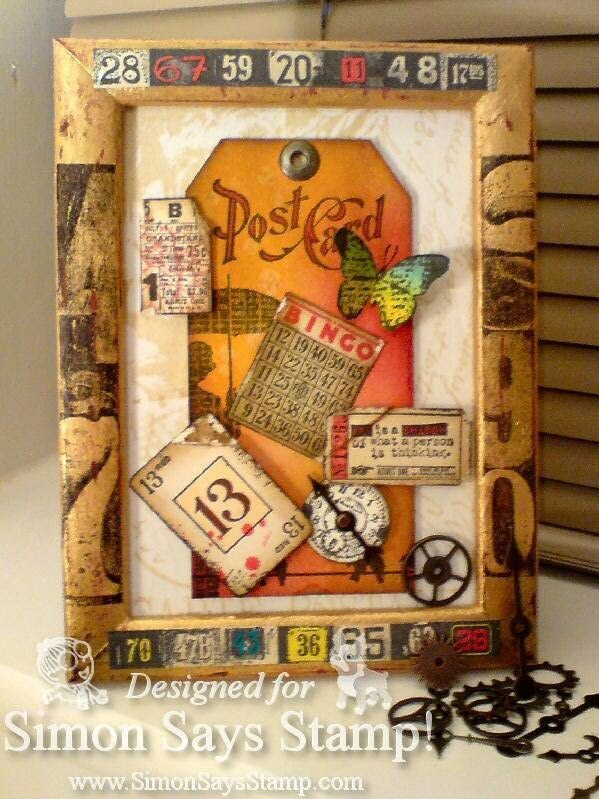 Anything Lord Tim of Holtz inspired! Tim is the Master of Distress ... he is the Lord of Vintage and genuinely an all round good guy! His demos are amazing ... he shares everything he knows and what this guy does n't know about the products he uses ... well ... quite frankly ... it ain't worth knowing! I could go on all day about him ... as lots of you already know :0) ... but I won't ... instead here is what the design team came up with for you this week and obviously ... here is a link to the great man himself. Lynne's project began with a tag, the basis for so much of what Tim does! She says she felt that she needed to take it one step further ... so she did ... and attached it to a canvas. 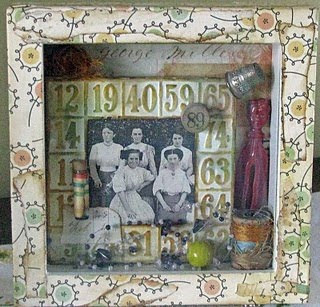 Lynne also added that she was n't sure any project had taken her this long or had been this much fun!I love what she did with the Tattered Floral Die and don't the Metal Corners and Curio Knobs look fab? Nancy has made this beautiful mini-book to record everyday happenings. Each tag incorporates a different technique learned from Tim. The tags have all been gathered into a mini-book with one of Tim's D-rings holding it together. Nancy has blended the Distress Inks beautifully with Ink applicators and she has used lots of Tim Holtz's Idea-ology product line. 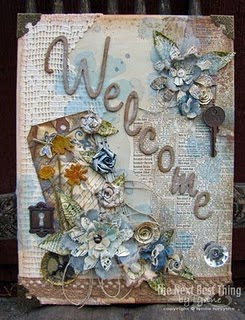 Katie has taken Tim Holtz Papers ... Distress Inks ... and embellishments from her stash to make this pretty little mini book. Kim found it hard to narrow her choice down to just a few Tim Holtz inspired elements. 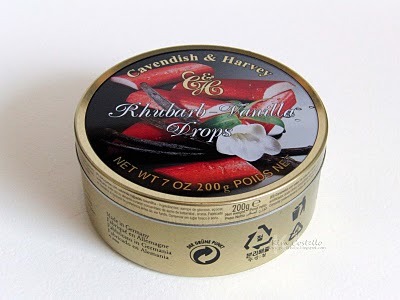 She prepared the tin with Pitch Black Paint Dabber and used Elmers glue and a Blue Paint Dabber for the crackle effect. 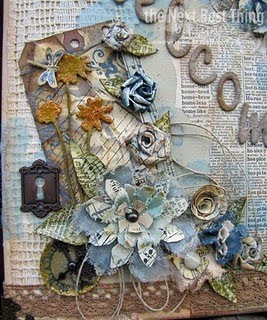 Just look how she has used the Tattered Florals dies cut with Tim's Shabby Chic papers. A beautiful project and I love how she cut Tim's heart wings from shrink plastic to make a magnetic charm. Lori said ... "Distress Inks are the first things that come to mind when someone says, "Tim Holtz". I use these ALL the time. I'm also in love with the Lost and Found paper stack. Total vintage goodness here. Add some Filmstrip ribbon, some of Tim's stamps, and grab your tickets, 'cause we're going to the movies!" Where to start? ... actually when it comes to Tim ... starting for me is n't the problem ... it's the when to stop I struggle with! Many moons ago Tim signed a stamp for me in London ... his words were "Enjoy the journey" ... and that was my inspiration. 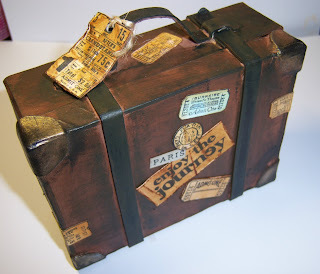 I used Tim's Classic Collage and Going Somewhere stamp plates ... and lots of Claudine Hellmuth's yummy paints to distress this suitcase blank. Linda also chose tags for her stunning project, and she decided to make an autumn home decor item by styling her tags into an accordion. She created four panels to represent four months: August - back to school, September - the beginning of fall, October - Halloween and November - Thanksgiving. There are lots of yummy Timmy goodies on this one including Salvage Stickers, Game Spinner, Muse Token, Grungeboard Elements, Philosophy Tag, Tattered Florals Die, Distress Inks, Distress Embossing Powder and Crackle Paint. I LOVE this frame that Dan has made and this is what he said about it "I couldn't do something in the Tim Holtz style without including a tag somewhere in there! I used some of his brand new stamps from his latest collection, in tandem with some of his earlier designs which have particularly resonated with me. Distress inks played their part too, of course, along with some glossy accents and some of his hardware." 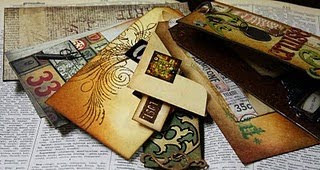 Tim Holtz's enthusiasm for his craft hooked Nancy from the first time she looked at his blog ... Nancy say's "Tim's style is my own - vintage to the max." Nancy has wanted to use this photo of her grandmother as a young woman for quite awhile, then Tim's Sizzix BINGO Texture Fade came out and she knew that she had to use it with her photo. She used the Big Shot, embossed white cardstock, then trimmed it to make a photo frame. She inked the cardstock with Wild Honey and Tumbled Glass Distress Inks. Terry is completely new to Tin's style. She only knew of Tim Holz because of his Distress Inks....so she checked out his blog and his demo's... and she now thinks The Tim Holz is amazing. 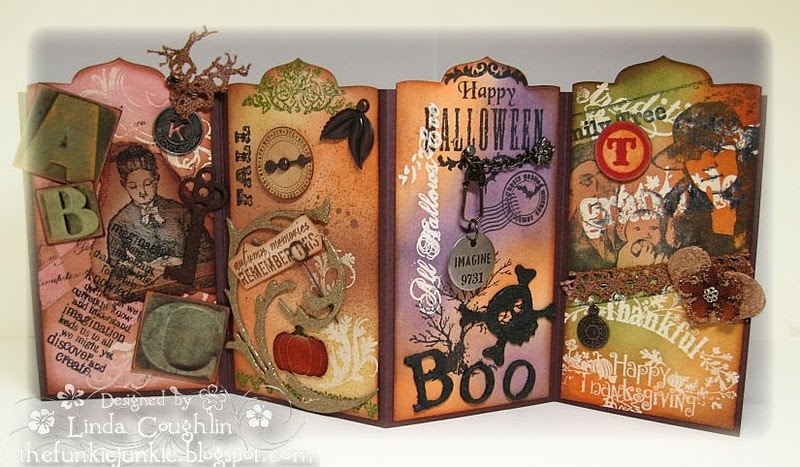 Terry has made this lovely mini book with Distress Inks and lots of other yummy Timmy goodies. And now...it's your turn to do ... well ... anything ... Lord Tim of Holtz inspired! The Design Team cannot wait to see what you all come up with! Don't forget that you could win this week's wonderful prize! It's an autographed Tote bag and if that wasn't enough ... an autographed Compendium of Curiosities along with a sheet of Tim's stamps - the 100th Anniversary Edition called ODDS N ENDS and some Distress Inks, the TICKET STRIP Sizzix Die, 3 of Tim's new colors Distress ink, and a Blending tool! The prize has been donated by our Site Sponsor Simon Says Stamp and will go to a random entry chosen by Random Generator. The challenge will close at Midnight Ohio time on Sunday 29th August 2010 and the winner will be announced during the following week. 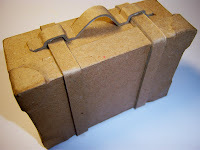 To qualify all you need to do is create a new piece of work related to this theme ... post it on your blog ... with a link to this site and then pop a link below so everyone can come see what you made! And who knows ... if you don't win this prize ... your work may be selected for the specially designed Top Three Blinkie. Well, after Wendy, comes Tim - although I couldn't choose between them!! I can't wait to do this week's challenge either - just wish I didn't have to wait for the end of the working day first. Fabby prize, once again. The DT work is all just incredible, I especially love Lynne's canvas. Gorgeous DT work, and who wouldn't WANT to join in with this one??? Where would we be without the Crafting God himself? Off to get started!! What wonderful DT examples! Amazing! so fun to read this blog-great inspiration! This week, there is alot of scope, in fact endless possibilities. I made a trio of pieces last week which just happen to fit the bill. There are some very interesting DT pieces on show up here and I was wondering how big Linda's suitcase actually is, it looks so real. Easy for me this time as I don't have to dream up anything new. Can you enter this if you don't have a blog? Or is it for bloggers only? Holy Canoli! You all are so uber talented. Such a feast for the eyes, heart and soul! I'm so excited I can hardly sit and type this! That prize is drool-worthy; I would actually faint if I won it! And then wake up and remember it all and faint again! :) Seems like there isn't anything I've created lately that ISN'T inspired by Our Lord Tim, so this challenge is right up my alley. The examples this week are simply stunning - so very Tim-worthy! I am loving this blog and all the great inspiration. Thanks for all you do! What an awesome drawing! 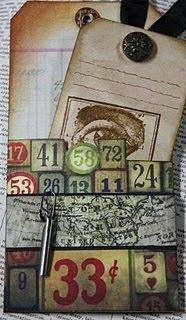 I've been a fan of Tim Holtz for-like-EVAH! I really enjoy his creative style, and I'm so glad to have someone of the male persuasion influence this amazing field. Here's my small offering which employs his inks and stamps. I look forward to acquiring some of his Sizzix dies as well. Love your fantastic giveaway - makes me wanna run and create right now - inspiring works from everyone... wow! I just added my link. Great fun! Wow, this is awesome. Although, random generator picking certainly leaves it to not really do too much because it won't matter what you make. It's just a random comment win. Thanks Linda! Now I just have to get on that! STUNNING DT creations! So inspiring, thanks everyone! LOVE it here! Will definitely be back for more fun! Hey Lynne~ looking forward to meeting you in October!! I was bummed that I missed Wendy's challenge . I just love her! No way I was missing a Tim challenge. Fun! Once again I see some incredible art from the DT!! Mine is done and I will be going by all that I can to take a looky! Have a great evening! Okay, I made another card, and hopefully it is okay for the challenge... I really love this one, as I have SO much Tim stuff lol! This is such a fun new blog! Right up my alley....I didn't go all out Tim Holtz..but my project was def. inspired by the man ;) thanks for the challenge! Amazing projects this week! Can't wait to see what next week will bring - now that we've done both Wendy and Tim.... now the mystery will start... I like that part! Awesome work there lady. Where did you get the blank suitcase? That is really nice! oooo!! i made it after all :) YAY!! Fantastic work, like Helen I had a struggle with this, so I am showing something I made a few weeks ago. Wonderful DT samples, thanks for the inspiration! Fantastic work by the DT, especially love that minibook by Terry. Thanks for the challenge, it was fun! What fabulous examples the DT have come up with this week, they are all gorgeous. I especially like Linda's suitcase, it's just so cute. Wow, the design team is very inspiring-and a bit intimidating! LOL! My tag is sorta double-duty-ing it, I hope it posts, I'm having trouble with the links...but I will refer everyone to my disclaimer #3 on my blog;if it doesn't work tonight, I'll try again sober tomorrow! Wonderful designs by the DT! Fun challenge. Fabulous artwork from the DT! They are all brilliant! Stunning artwork, especiially loved Linda C's accordion tags. The amount of work that went into many of these pieces is amazing. The TH samples are beautiful and amazing. They certainly show wonderful talent. I don't know what's hapenning. I've resubmitted twice. The first time I forgot to put the link in for this post but I corrected that and my 2nd try was deleted. Hope it works this time! KAT and Rhonda should win!! !